Practice in Time: It's another Trash-picked Tuesday! I found this adorable vintage stroller out by the curb about three years ago. (Without the baby in it; that's my daughter sleeping in it last year!) Since then, I've used it quite a bit and it never fails to get compliments. It has three main parts, all of which were intact and in great shape. The main stroller frame is chromed steel with white rubber tires. It has a springer suspension, wire wheels and a foot board that is embossed with "Collier". This part is used once the child is big enough to ride sitting up. The other parts are a bassinet top and hood made of "Black Watch" plaid fabric with white trim. There is a mattress inside the bassinet so the baby can lie down. My daughter loved it- she always slept in it. I even parked it inside (as you can see in the photo) so she had a place to nap while I worked in my office. The stroller folds down just like a modern "travel system" so you can put it in your car. It's a lot lighter than a modern stroller as well. It just doesn't have all the bells & whistles, like cup holders and storage bins. But for taking walks to the park or around town it was so much fun, and got so many compliments. I loved to tell people where I got it! 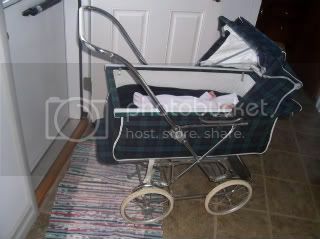 ;) And to top it off, I saw a modern reproduction of this stroller somewhere for over $600! Katy and the Big Snow!